But it would probably get significantly more popular if Obama actually orders a strike. It's often said that the U.S. military is perpetually fighting the last war -- and the backlash against President Obama's plan for strikes has shown just how menacingly Iraq looms in the American consciousness. Poll after poll, and call after call into congressional offices, show that war-weary citizens really don't want to attack Syria. 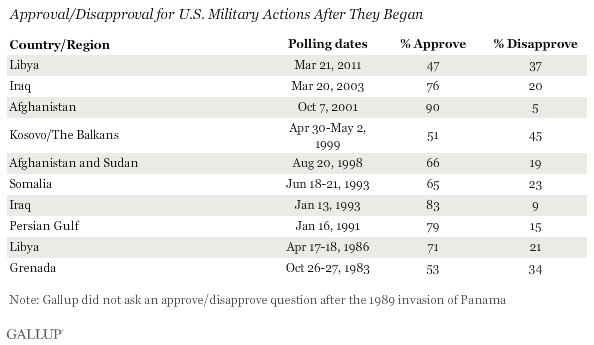 This doesn't tell us everything -- we don't know, for example, how excited Americans were about the 2011 bombing of Libya or, say, the 1998 bombing of a Sudanese pharmaceutical factory (presumably there was too little lead-up for Gallup to ask). But it does provide some useful context for the widespread outcry in recent days. What ought to give folks like Ben Rhodes, Obama's spokesman for national security, ulcers isn't just that strikes against Syria are less popular than past attacks -- it's that their favorability is deeply underwater, with a 15-point deficit between support and opposition. Even if every undecided in this poll were persuaded, it'd still be overall unpopular. Kosovo wasn't well-regarded, as you can see, but the numbers were more or less equal. With the exception of Iraq (an amazing 18-points), the average post-attack bounce seems to be closer to eight or nine points. A bounce of that size would still leave an attack on Syria with a lower approval rating than disapproval. One might find it surprising that even though their party made opposition to the Iraq War a litmus test during its 2008 primaries, a slight majority of Democrats (45-43) tell Gallup today that they back intervening in Syria, while Republicans and independents overwhelmingly oppose it. But political scientists have shown that party identification is more based in tribal identity than policy agreement. This is more evidence.